So in case you’re not part of the twitterses or facebookses you may not have heard that we got a new cat. Well, technically it was Casey who paid the adoption fees, so … anyway, the point is that Barton lives with us now. The strange thing about … yeah, I know, you can see in the picture that he’s carrying a ball. He fetches. 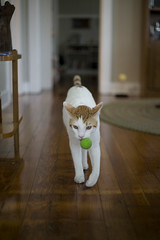 Now I’ve known some cats that would fetch occasionally, but fetch is his favorite game of ever. He will fetch at least 20 times in a row before he starts to get bored, and he’ll be up for another game of fetch in an hour. We even have a video of Barton fetching so that you know Casey didn’t just Photoshop a ball into his mouth in this picture. He loves fetching so very much that last night he jumped up into our bed with a ball in his mouth and dropped it between us. He did this not once but twice. I told him, “Barton, it’s dark outside. It’s dark inside. This is not the right time to play fetch.” He didn’t really want to hear it. He never wants to hear that it’s not time for fetch. So there you have it – our pretty boy from the LA SPCA has a nice trick. Oh, hey, yeah, let me mention that the LA SPCA was wonderful. We got a cat, neutered and with all his shots, and microchipped, AND a bag of Science Diet cat food all for $75. That is, in my opinion, a hell of a deal, and we managed to save this soft white fluffy fetching lump from possibly being sent to his demise. We are jealous! We wantz Catdog!